On 19 August, U.S. Coast Guard observers reported that Pyre Peak . . . was continuing to erupt from a vent ~180 m below the summit. A dark ash plume over the volcano that day reached an altitude of 2,500 m and drifted ESE. No reports of ashfall in the sparsely populated region were received. U.S. Coast Guard observers reported that Pyre Peak was continuing to erupt in late August, but poor weather conditions prevented observers from confirming continued activity through 3 September. Frequent poor weather and limited air traffic combine to make tracking of activity at this remote island volcano difficult. The Global Volcanism Program has no Weekly Reports available for Seguam. Jürgen Kienle reported that on 6 March at about 0400, the crew of the USCG Cutter Mellon observed and photographed eruptive activity at the 750-m level of Pyre Peak, Seguam Island. Eight lava fountains rising to an estimated 90 m were observed along a l-km radial rift 2.5 km SW of Pyre Peak summit. Activity appeared to be progressing NE (towards the summit). A lava flow formed and divided into two tongues. The larger was approximately 2.5 km long and l km wide. The smaller moved toward the S, and was approximately l km long and 0.5 km wide. Three dense black clouds were erupted from the vent during 2 hours of observation, after which the Mellon departed. The nearest short-period seismometers, 225 km to the E (Nikolski), and 300 km to the W (Adak), were too far away to register any unusual earthquake activity. Thomas Miller reported that on 8 March, a Reeve Aleutian Airlines flight passed over Seguam at low altitude. The pilot reported that lava effusion and fountaining had ended, but that a considerable amount of steam, possibly containing some ash, was being emitted from the fissure. Lava flows had not reached the sea. Poor weather during much of the year hampers aerial observation. Several other ship reports of eruptions in the area have been received in the past several years. Seguam is uninhabited. Information Contacts: J. Kienle, Univ. of Alaska; T. Miller, USGS, Anchorage. Small ash eruptions from a satellite cone 1.5 km S of the W caldera's central cone (Pyre Peak) (figure 1) were observed on 27 and 30 December 1992 by the U.S. Coast Guard . . . . Activity on the 27th consisted of an ash plume that extended 24 km N from the island at 1,200 m altitude. On 30 December, discrete explosions ejected ash to several hundred meters height. Ash fell S of the vent, which appears to be located near the N end of a line of lava fountains observed during the 1977 eruption. The vent site consists of a cluster of cinder cones and craters, which was probably the source of a prehistoric basaltic lava field covering ~21 km2. Figure 1. Topographic map of Seguam Island showing the area of December 1992 activity (dot S of Pyre Peak). The line SE from the vent site represents the 1977 lava fountains, and the outline shows the 1977 lava flows. Courtesy of AVO. Information Contacts: Michael Doukas, USGS Anchorage. A small ash burst, rising through clouds near Pyre Peak, was reported by the U.S. Coast Guard on 28 May. A plume to 3 km altitude was reported on 2 June by the NWS, but it is not known if the plume contained ash. Heavy ash eruptions rising 900-1,200 m were reported the morning of 31 July by the U.S. Coast Guard. A lava flow was also noted. According to these observers, the volcano was still erupting sporadically on 10 August, with light- to dark-gray ash plumes rising 2,400 m above the summit. Reports from Atka Island (~110 km W) indicate that weather conditions have frequently prevented observations. The elliptical, 11.5 x 24 km island of Seguam, lying between Amlia and Amukta Islands in the central Aleutians, contains two calderas with Holocene post-caldera cones. Growth of the basaltic-to-rhyolitic Wilcox volcano on the east side of the island during the late Pleistocene was followed by edifice collapse and an associated ignimbrite eruption about 9000 years ago, leaving a horseshoe-shaped caldera open to the west, inside which a rhyolitic cone was constructed. The 3 x 4 km wide westernmost caldera has a central scoria cone, Pyre Peak, which rises above the caldera rim and is the source of most of the historical eruptions of Seguam volcano. A very young basaltic field surrounds Pyre Peak, and lava flows partially fill the caldera and reach the southern coast. 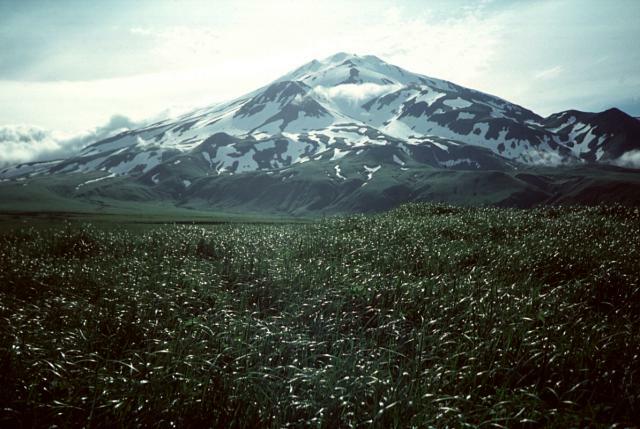 Older Holocene lava flows were erupted from vents within the eastern caldera, and a monogenetic Holocene cone forms Moundhill volcano on the eastern tip of the island. Jicha B R, Singer B S, 2006. Volcanic history and magmatic evolution of Seguam Island, Aleutian Island arc, Alaska. Geol Soc Amer Bull, 118: 805-822. Singer B S, Myers J D, Frost C D, 1992. Mid-Pleistocene lavas from the Seguam volcanic center, central Aleutian arc: closed-system fractional crystallization of a basalt to rhyodacite eruptive suite. Contr Mineral Petr, 110: 87-112. Remarks: Uplift of the eastern caldera due to basalt injection into the magma reservoir. Average line-of-sight surface displacement rate maps for Seguam during five time intervals (stages) based on the time-series shown in Fig. 5: (a) Stage 1, January 1993?October 1993, (d) Stage 2, October 1993?November 1998, (g) Stage 3, November 1998?September 2000, (j) Stage 4, September 2000?November 2005, and (m) Stage 5, November 2005?July 2007. Images 5b, 5e, 5h, 5k and 5n are corresponding best-fit model interferograms using a Mogi (1958) source with location of source in the center of the caldera (star). Images 5c, 5f, 5i, 5l and 5o are corresponding residual interferograms showing differences between observed and model interferograms. From: Lee et al. 2013. Reference List: Lee et al. 2013; Lu and Dzurisin 2014. Remarks: Subsidence of the eastern caldera due to cooling and degassing of the upper part of the magma reservoir. Reference List: Lee et al. 2013; Lu and Dzurisin 2014; Masterlark and Lu 2004. Remarks: Subsidence in the western caldera due to thermoelastic compaction of young lava flows. There is no Emissions History data available for Seguam. Lava fountains rise above a fissure on Seguam volcano on March 8, 1977. This view from the south shows part of the 1.5-km-long eruptive fissure SE of Pyre Peak, the volcano's summit. Black lava flows move across the snow from the fissure and diverge around an older, snow-covered cone at the lower right. Two large late-Quaternary calderas occur on Seguam Island, both of which contain Holocene cones. Pyre Peak, in the western caldera, is surrounded by fresh lava fields and dominates the western half of the island. 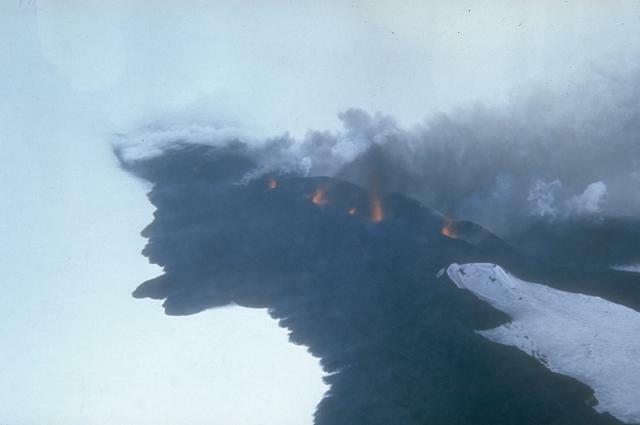 Photo by U.S. Coast Guard, 1977 (courtesy of Alaska Volcano Observatory). The snow-dappled slopes of Pyre Peak are seen from near the western tip of Seguam Island. The elliptical, 11.5 x 24 km island contains two calderas, each with a Holocene central volcano. A third Holocene cone lies at the eastern end of the island. Pyre Peak was constructed within the 3-km-wide westernmost caldera. The 1054-m-high cone rises 1 km above the caldera floor and has been the source of most of the historical eruptions of Seguam volcano. Photo by Steve Ebbert, 1996 (U.S. Fish and Wildlife Service). There are no samples for Seguam in the Smithsonian's NMNH Department of Mineral Sciences Rock and Ore collection. IRIS seismic stations/networks Incorporated Research Institutions for Seismology (IRIS) Data Services map showing the location of seismic stations from all available networks (permanent or temporary) within a radius of 0.18° (about 20 km at mid-latitudes) from the given location of Seguam. Users can customize a variety of filters and options in the left panel. Note that if there are no stations are known the map will default to show the entire world with a "No data matched request" error notice. Large Eruptions of Seguam Information about large Quaternary eruptions (VEI >= 4) is cataloged in the Large Magnitude Explosive Volcanic Eruptions (LaMEVE) database of the Volcano Global Risk Identification and Analysis Project (VOGRIPA).